Summer, for many of us, offers a few of those long, unbroken stretches of time that, unlike the rest of our hurried, fragmented lives, positively cry out for a great big, abiding read. So perhaps this is the moment finally to tackle War and Peace. Widely acknowledged as the greatest novel ever written, War and Peace is also a perennial bestseller, with new editions appearing regularly, almost a century and a half after its first publication. 1. It’s a mirror of our time. At its core War and Peace is a book about people trying to find their footing in a world being turned upside down by war, social and political change, and spiritual confusion. The existential angst of Tolstoy and his characters is entirely familiar to those of us living at the beginning of the twenty-first century, and his novel has important things to say to us in this moment. Over and over again the book shows how moments of crisis can either shut us down or open us up, helping us to tap into our deepest reservoirs of strength and creativity. 2. It’s a riveting history lesson. If you like history, you’ll love War and Peace, which depicts a transformative era in a way that continues to stir and enlighten readers. Tolstoy brings the past alive by taking you inside the forgotten little moments of everyday life that historians often overlook. He’s so successful, in fact, that many Soviet soldiers who were given sections of War and Peace to read in their barracks during World War II claimed to have been more moved by Tolstoy’s descriptions of the war than by the battle taking place before their very eyes. And because of War and Peace, most Russians have regarded the war of 1812 and the famous, bloody battle of Borodino as a unique Russian victory. Tens of thousands of their countrymen were slaughtered at Borodino, but that battle happened to anticipate Napoleon’s fateful retreat from Moscow—a turn of events that would change the course of European history forever and that Tolstoy described as powerfully as any historian ever has. 3. It’ll help you understand Russia today. If you want to understand why Russians today have such a complicated relationship with the West, read War and Peace. The novel’s description of Napoleon’s failed attempt to conquer Russia in 1812 would become a deeply ingrained cultural trope that future Russian leaders drew on to illustrate both their country’s greatness as well as her vulnerability to outsiders. Putin is drawing on precisely that idea when he tries to convince his people that they’re under threat from the West, evening blaming the crisis in Ukraine on Western interference. But in War and Peace, there is also a message of universal humanity that transcends politics altogether. Tolstoy offers a model of patriotism free of nationalism that Putin would do well to heed. 4. It’s one of the wisest self-help books you will ever read. War and Peace isn’t just a great novel. It’s also a guide to living. What Tolstoy offers is not so much a set of answers to life’s every situation as an attitude toward living. He invites us not to settle for the prescriptions of others, but to join him and his characters in their quest for deeper meaning, to keep asking the important questions and seeking out authentic experience on our own. History, Tolstoy tells us, is what happens to us. Destiny is what we do with it. 5. It’s an engrossing read. War and Peace revolutionized the modern novel, in part, by packing in more human experience than any other work of fiction had ever attempted. Henry James called Tolstoy “a monster harnessed to his great subject—all of life.” In 361 cinematic chapters of a few pages each, he moves seamlessly back and forth between ballrooms and battlefields, marriages and massacres, private lives and public spectacles. You see, hear, and feel everything in Tolstoy’s world: glistening sunrises, whining cannonballs, exhilarating troika races, glorious births, brutal deaths, and everything in between. If a human being has ever experienced it, War and Peace depicts it. 6. You’ll get to know a lot of fascinating people. Almost 600 of them, in fact. How often do you have the opportunity to meet that many people from so many different walks of life? Each one of them, even the minor ones, is utterly recognizable and fully alive. Nobody is all good or all bad in War and Peace, which is what makes these characters so real, so human. Even Napoleon himself, the closest thing to a villain in the novel, is, at least, interesting. There are even a few moments when Tolstoy allows us to glimpse into his soul and feel his pain, as when Napoleon surveys the corpse-strewn battlefield of Borodino, only to realize the full extent of his cruelty, as well as his impotence. As a writer, Tolstoy follows his own injunction to “relate, portray, but do not judge,” and in so doing, he creates characters that live and breathe. 7. It’ll make you feel better about being alive. This book chock full of moments of human brutality, of battlefields drenched in blood, also contains some of the most powerful moments of transcendent bliss you’ll encounter in world literature: Prince Andrei, seeing the gorgeous immensity of the universe for the first time while lying prostrate on the battlefield; or Natasha, when she dances and sings, as if nobody were watching; or Nikolai Rostov, immersing himself animal-like in the thrill of the wolf hunt. The world, Tolstoy shows us in his greatest novel, is a mysterious place where things aren’t always what they seem, today’s tragedy often paving the way to tomorrow’s triumph. That’s the message that inspired an incarcerated Nelson Mandela, who called War and Peace his favorite novel, and it’s one that can comfort and inspire readers in our own troubled times. 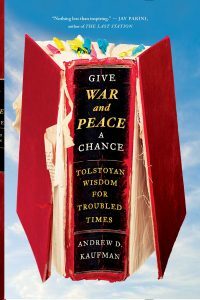 Purchase Give War and Peace A Chance: Tolstoyan Wisdom For Troubled Times right now for only 99c on Amazon!